Posted on June 26, 2012	by Lou Murray, Ph.D.
Arg, I can’t figure out how to work with photos on my new Mac. I can download them from camera to computer, but still don’t know how to process them. I have iPhoto and Aperture, but can’t find my new pictures in either program. I bought Paintshop Pro, which is what I used on my PC for photo processing, but can’t even seem to download it successfully. Frustrating! So you’re seeing unprocessed photos. View of our front yard raised vegetable bed. If the only sunshine your yard gets is in the front, grow your vegetables there! That way, everyone can enjoy looking at your garden. Looks like my butternut squash and cucumbers are taking over. We just got back in town after a week in Portland, OR, so I’m playing catchup in the garden. 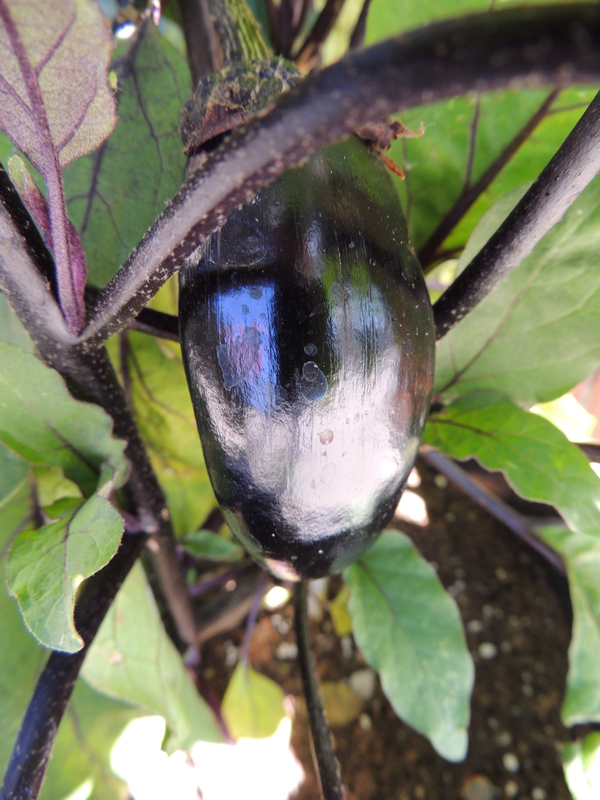 The Millionaire eggplant is setting fruit but nothing is ready to harvest yet. 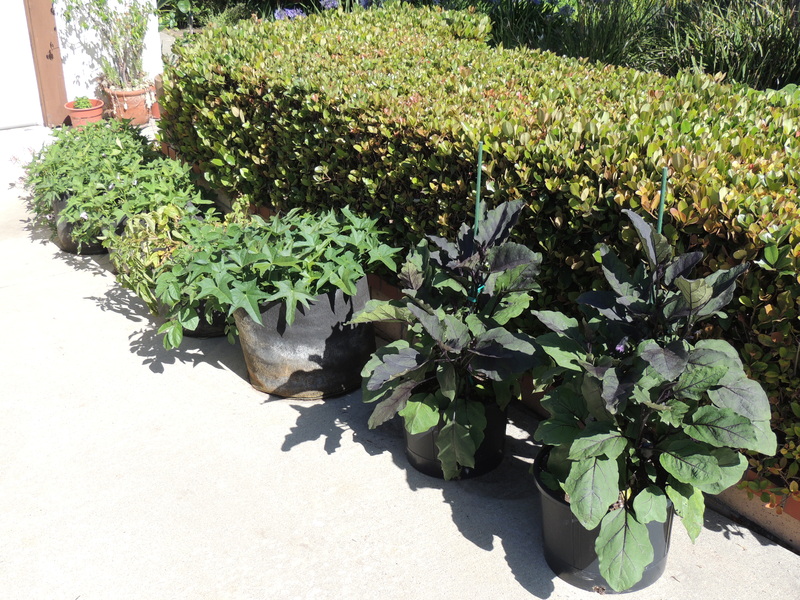 I grow yams, potatoes, and eggplants in containers in the driveway. The pot of blue potatoes is almost ready to harvest. This is my pumpkin patch. I’m attempting to grow a Rouge Vif d’Tampes and a Queensland Blue pumpkin for each of my three little granddaughters. 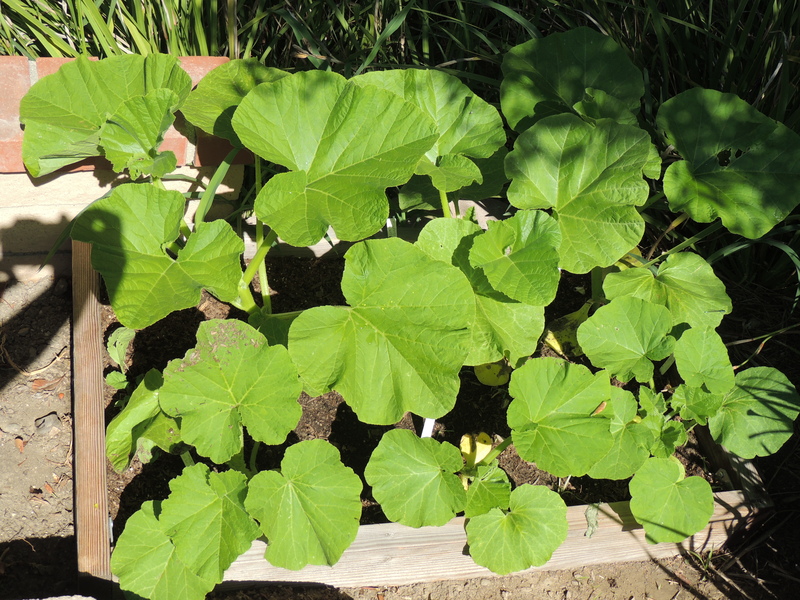 I’m thinking that six pumpkins in one little bed might be too much. Nothing ventured, nothing gained. So far the plants look healthy. This is the first butternut squash to have set fruit. The silly thing is growing upside down. 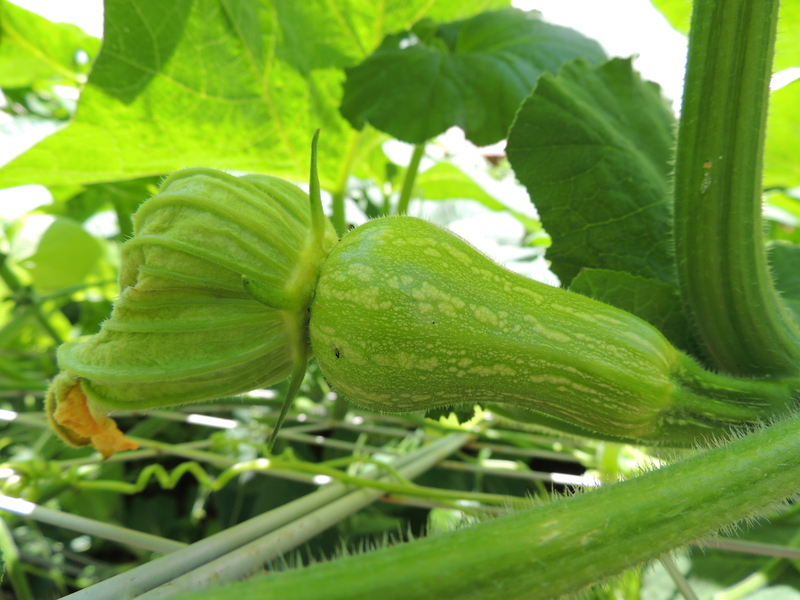 A second butternut blossomed a couple of days ago and seems to have set fruit. I’m growing them on a trellis to save space in my tiny garden. 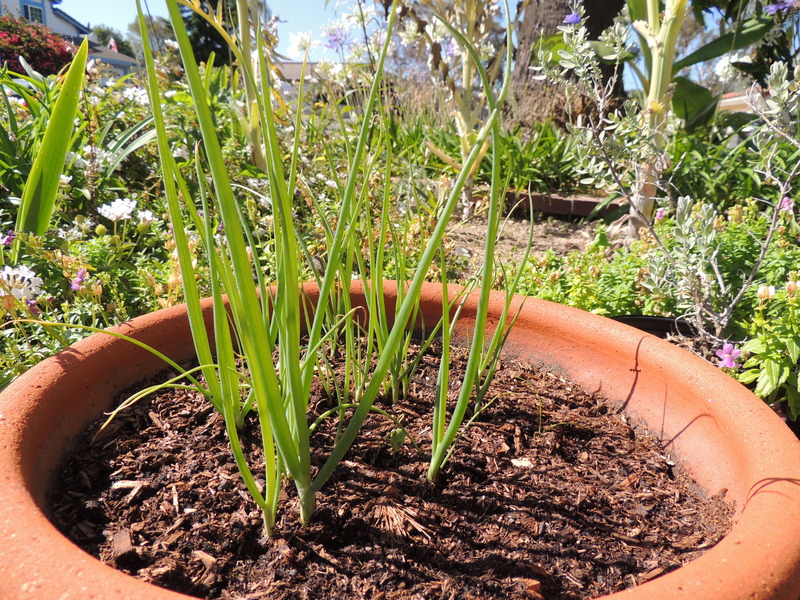 Green bunching onions do nicely in a ceramic bowl. These are coming along. A Box Car Willie tomato. Amish paste tomatoes. 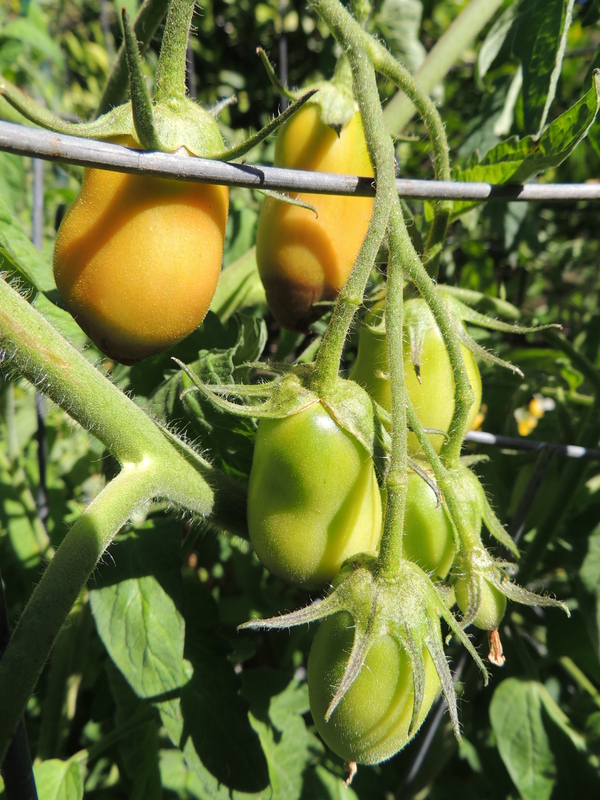 Or maybe these are the Big Russian Paste tomatoes. Oh, boy, they’re turning ripe! 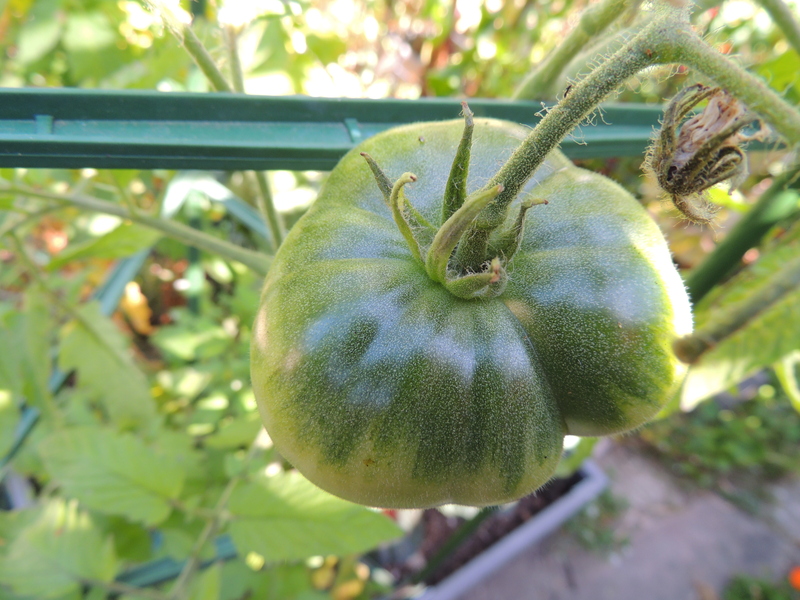 But Mortgage Lifter already won the race for first ripe tomato in my yard. These will be second, beating out Early Girl. 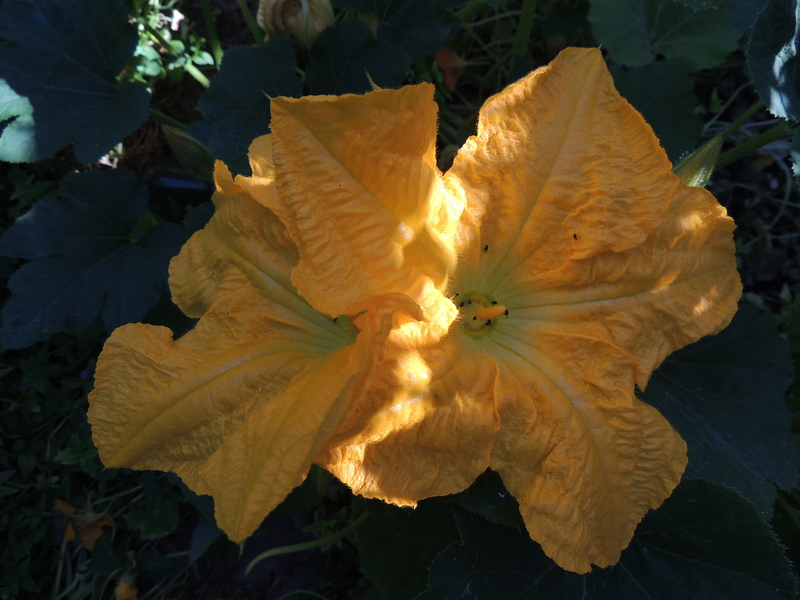 My “mystery pumpkins” that sprouted from the compost pile are making lots of male flowers. And the “mystery pumpkins” are beginning to make fruit. Sure looks like a zucchini. But it’s shorter and fatter than a zuke, not the typical shape. I let one of them get big, and it’s a really dark green but shaped more like a spaghetti squash without the ridges. 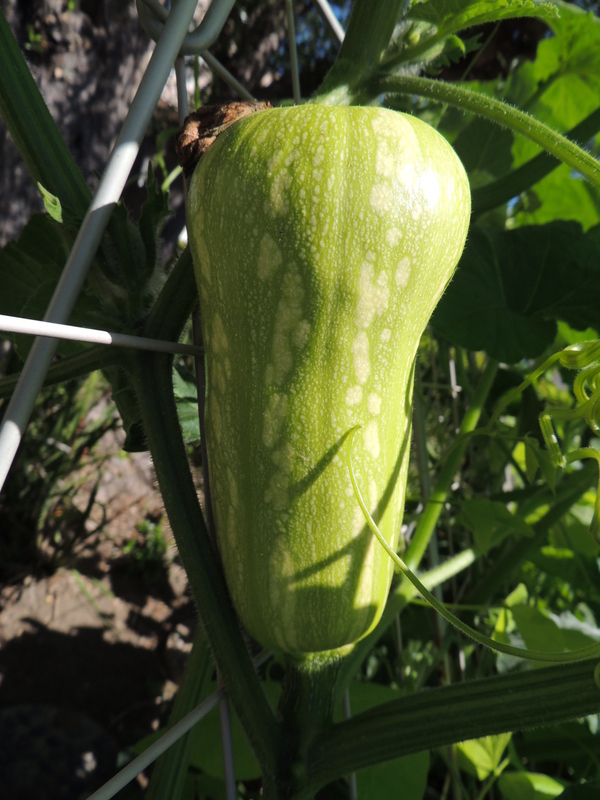 I had no seeds from spaghetti squash or zucchini in my compost pile, so it had to be a hybridized seed. Those squash are so promiscuous. 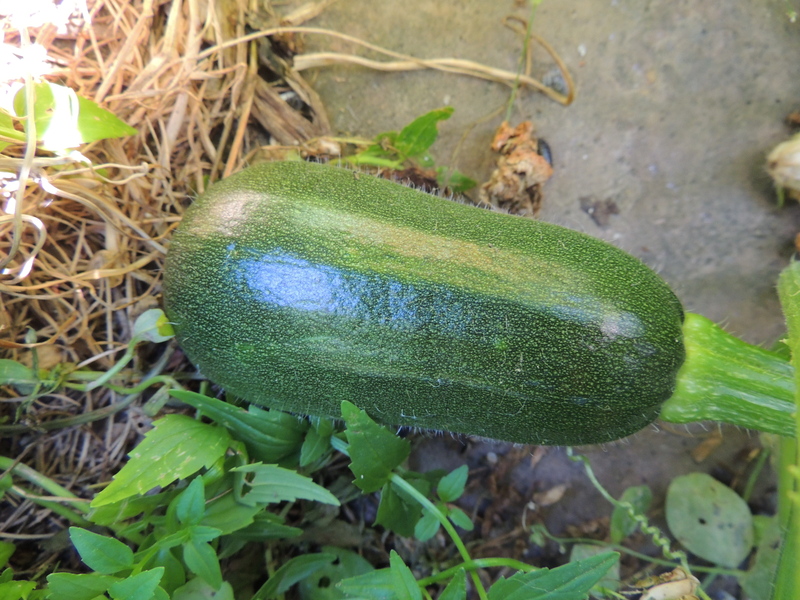 I think I’ll try eating this one as a zucchini and see how it tastes, but I let the other one get HUGE, thinking it would turn into a pumpkin or winter squash of some kind. Now I’m thinking that it’s just going to be an old zucchini. I’ll eat it anyway. 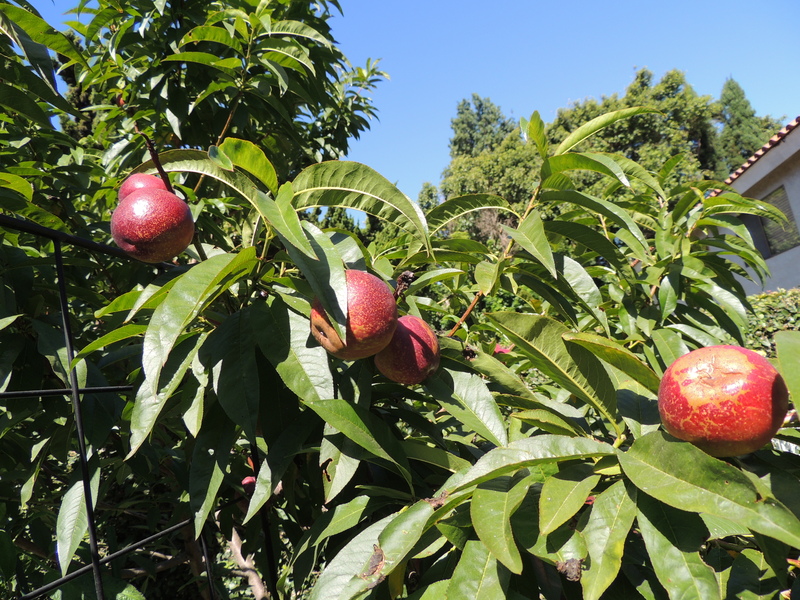 The nectarines are still hard as rocks, but they look beautiful. Hiding way up there in the foliage is my first ripe Santa Rosa plum of the season. 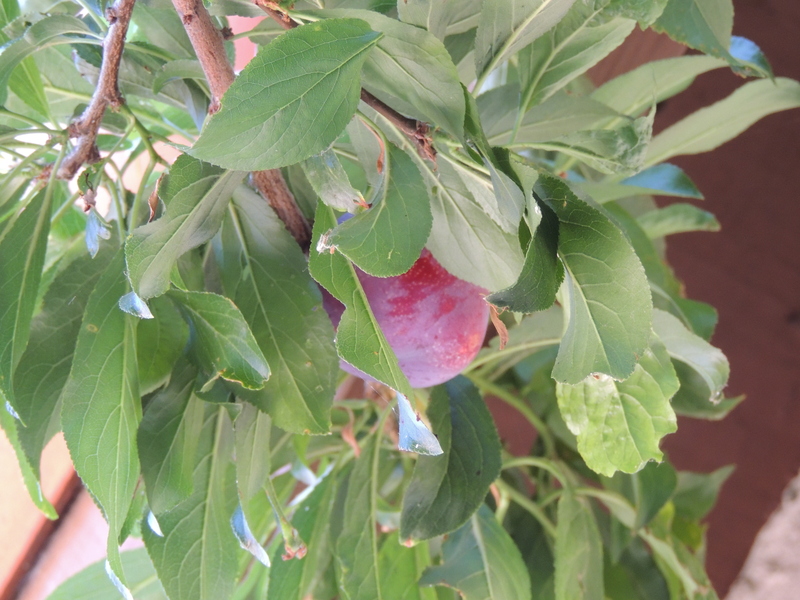 The possums left me a measly four plums, and since three aren’t ripe yet, they could still get them. 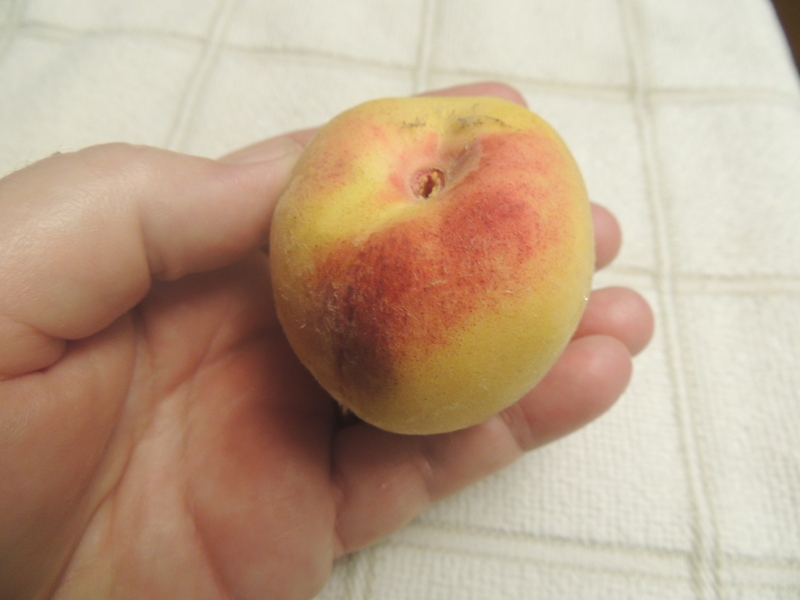 This is one of three August Pride peaches. They have great flavor, but the skin is tough and fuzzy so they need to be peeled. The skin of the Babcock Improved is thinner and those peaches taste like ambrosia, with a hint of jasmine. Incredible flavor. The Babcocks are small this year and most aren’t ripe yet. 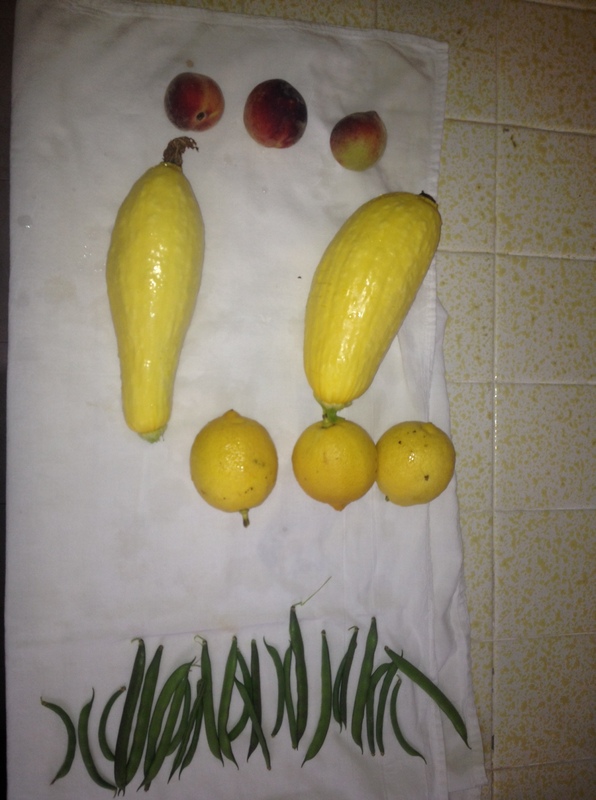 Our three little granddaughters harvested all of this produce, plus a lot of snow peas. Their dad took this photo with his iPhone and sent it to me. I managed to download it and find it on the iMac. Rotating it is beyond me still. Hi! I thought I’d try to ease some of your frustration! 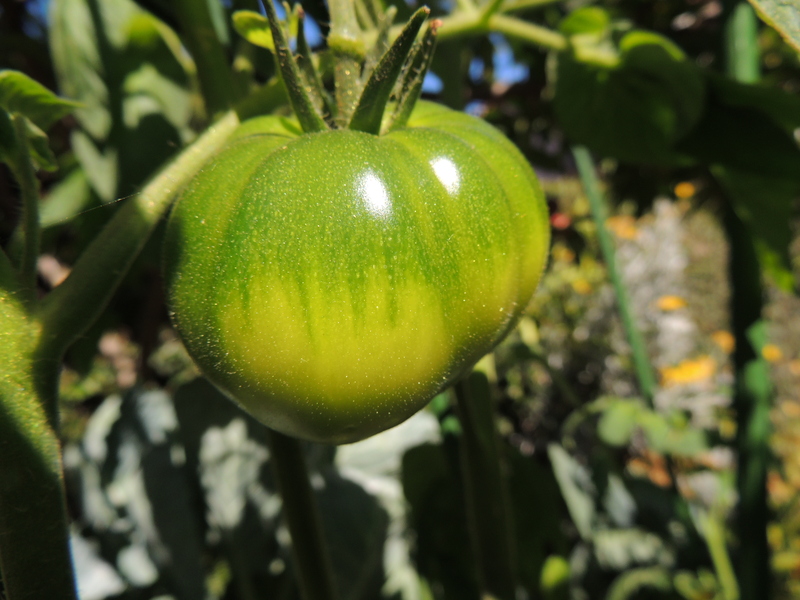 I use mac with my wordpress veggie garden blog as well. As far as iphoto, have it open. Then connect your turned-off camera to your computer and turn on your camera. A few seconds will pass and iphoto will recognize a camera plugged in to the USB. Select which photos you want to download. It will load them straight in. From there you can edit (click at bottom of page for each photo). Hope this helps some! Thanks, Jessica at Bountiful Backyard. I’ll give that a try. That is a lot growing in what sounds like a small space. I am always impressed by people with ingenuity and drive to create the lives they want in the space they have available. Thanks, Crafty Cristy. I don’t have much space, but I sure utilize what I have. A Mortgage Lifter tomato, how did this tomato get its name? Everything is growing so well in your garden. How do you keep the containers watered when you are away? Norma, see my answer to Rick at Stoney Acres for the name. We are seldom gone for more than five days, and most things do OK for that amount of time. If I’m going to be gone longer, like this past week, I ask our gardener to come water. He’s a sweetheart and does it. Normally he just trims hedges, pulls dead leaves off the irises and cleans up debris. We have no lawn to mow. LOVE the picture of your front yard! Butternut squash rules. What a beautiful yard and garden you have. Thanks for the tour. I love the name Mortgage Lifter. I think that name comes from the fact that some farmers use to plant a tomato crop that they would sell to the local canneries specifically to pay the mortgage! Rick at Our Stoney Acres, the Mortgage Lifter was supposedly developed by Radiator Charlie during the depression in the 1930s. He got huge tomatoes from this variety, and sold the plants for $1 each. He sold so many plants that he was able to pay off his $6,000 mortgage. I am sorry that you are having difficulty with photos on your imac. iPhoto is really a wonderful program. I plug in my camera and it loads up and I am able to select what I want to import into iPhoto. The program sorts by “Event” and it also allows you to edit your photos. Just double click on the photo, then click edit and you are presented with different options for editing your photo. I hope you figure out a system that works for you. Sharing garden photos should be fun, not frustrating. There is a lot going on in your garden. The tomatoes are very impressive and the squash is pretty crazy with the Butternut growing upside down and that mystery squash will be interesting to follow. Thanks for the encouragement, GrafixMuse. I use my Nikon software to import the photos. I managed to find them today in iPhoto and process them, but then I couldn’t email them in a batch as I had done earlier today. It’s just going to take me some time to figure out all this new stuff. If all front yard gardens looked as beautiful as yours, maybe more towns would allow them! Lovely photos, processed or not. Great harvest this week! You are way ahead of me. I have never known how to touch up my photos! Agriburbia, love that term. I’m still working on my photo skills. I managed to get photos into iPhoto and processed them, but couldn’t find them to email them. If it isn’t one thing, it’s another. Love your front yard! Great privacy and practical too! Good to know that you grow your yams and potatoes and eggplant in containers, I have more containers than beds. Can’t wait to see what you get from them! Crazy Garden, I harvested my first blue potato of the year today from the Gro Pot. It was 11 ounces. Not too shabby. Everything looks beautiful. I can’t wait for peaches Maybe I’ll get the first one next year. Daphne, I hope you get lots of peaches next year. Hopefully you will get the technology sorted out soon. I hate major computer changes it always takes me a while to get things figured back out and into my routines again. 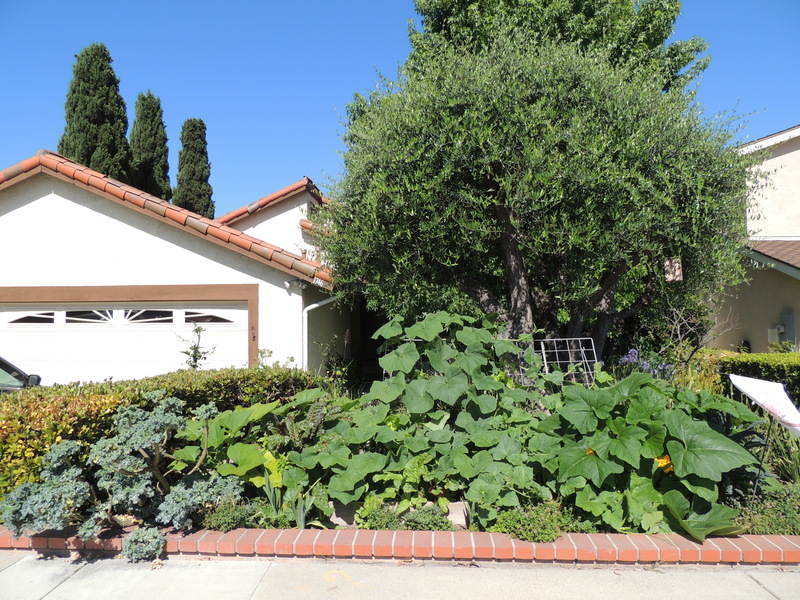 That squash patch in the front yard area is a thing of beauty. Really as dramatic as any large ornamental specimen planting. Kitsap and Leduesorelle, I hope my neighbors feel the same way. The garden looks really good now, but it isn’t always this attractive. Just wait until those squash start getting white with powdery mildew. 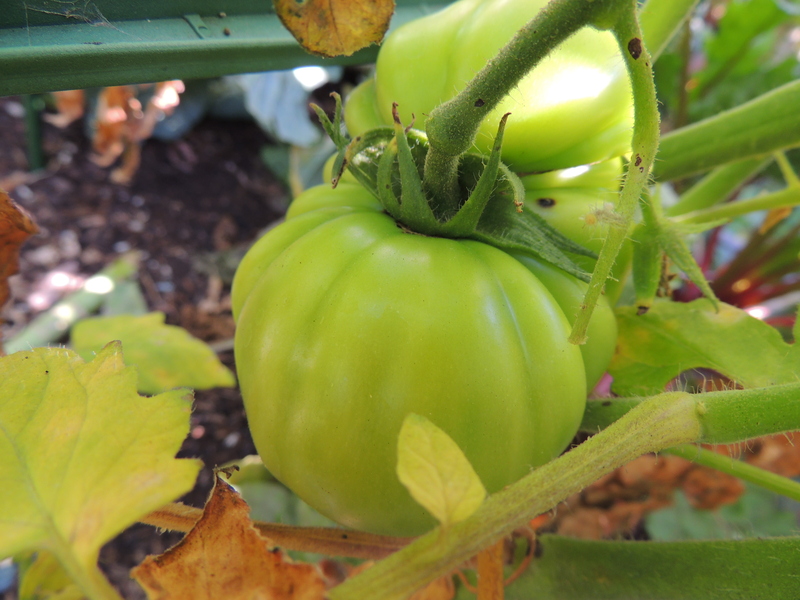 I’m with kitsapfg, I love seeing that you’re growing all that gorgeous food in your front garden! Lots going on around your place! Love all the peaches and plums; I never really liked peaches until I grew my own and ate it fully ripe and soft from the tree. So totally unlike those hard rocks they sell at the store! My Bonanza has a tough fuzzy skin too, but while washing the fuzz off if the peach is really ripe the skin slips right off! A handy thing for canning! Mary, I’ve rarely had a peach skin slip off without blanching. I don’t think I’m going to get enough peaches this year to make a peach pie, but I should have plenty for cereal.